Labyrinths are said to been used for over 3000-3500 years (depending who you ask), accurate dating has been difficult. We are told by those who promote their use that Labyrinths are ancient and have been a part of the sacred landscape through human history. Those who use the labyrinth describe them as a pattern with power and a purpose. They are called “divine imprints,” that symbolize an archetype of wholeness. The Labyrinth is said to encourage healing, clarity, and peacefulness. There are claims of profound experiences as they affect the people who use them by connecting them with the deepest part of themselves. Labyrinths can often have a particular “specialty” in healing, improving ones health or alleviating symptoms of certain diseases. From the Catholic Encyclopedia--Labyrinth is a complicated arrangement of paths and passages; or a place, usually subterraneous, full of windings, corridors, rooms, etc., so intricately arranged as to render the getting out of it a very difficult matter. However its use is not just found in middle age cathedrals, we find that the origin of Labyrinths are from pre-Christian days. This is what we need to pay attention to, what were they used for before the Roman Catholic Church adopted it for their contemplation and pilgramage substitute to the Holy land. Labyrinths predate Christianity by over 1,000 years according to an article posted on the Web site of Grace Cathedral in San Francisco “Pathfinders: Walking Medieval Labyrinths in a Modern World.” And the purpose of this article is make Christians aware that Labyrinths are not in any shape or form a Christian practice. Because they are ancient, various interpretations of the Labyrinths of today may not agree with the same concept of the labyrinths in ancient times. We can assume they did not mean the same to all the cultures and religions that built them, since there are various different concepts of life and religion within these cultures. Yet many feel there is a common origin of the Labyrinth because they are found in many countries and the major religious traditions in the world: India, France, Egypt, Scandinavia, Crete, Sumeria, America, the British Isles, and Italy. There is evidence of the existence of labyrinths that can be traced back as far as 3500 years. The labyrinth as a symbol has been found in Europe and around the Mediterranean. Many labyrinth carvings are found on boulders, tombs, religious buildings (in cathedral pavements). Many clay tablets, mosaics, manuscripts, stone patterns, hedges, patterns woven into baskets and fabrics and pottery fragments throughout Europe seem to bear the same motif. They are also found carved in rock from the mountains in Arizona to caves in Spain. A Labyrinth-inscribed clay tablet from Pylos, Greece, could possibly be one of the earliest examples (approx. 3200 years old). Some equate the Mayan pyramids and Celtic, and Stonehenge as magical geometric forms that define sacred space. Prehistoric labyrinths have also been found carved on rock faces at Pontevedra, Spain and at Val Camonica in northern Italy, these latter ones are attributed to the late Bronze Age. The Rocky Valley labyrinths in Cornwall, England, are supposed to be from the Bronze Age. The labyrinth is found etched into the sands of the Nazca Plain in Peru, in use among the Caduveo people of Brazil and scratched on boulders and rockfaces in Northern Mexico, New Mexico and Arizona. devoured unsuspecting humans. Theseus was able to get to the centre of the Labyrinth, slay the Minotaur with the aid of Ariadne and her spool of thread, and found his way out again by following the thread he had trailed behind him on the way in. Some say this story has caused confusion because clearly the Minotaur's lair was a maze that you could get lost in, whereas a Labyrinth has only one twisting path that weaves its way to the centre and back out again. There is only one entrance and exit, no dead ends, and no crossing of paths with a choice of which way to turn. Turf labyrinths still exist in England, Germany and Scandinavia; these are thought to be linked with local feminine deities and fertility rituals. “The labyrinth has its origins in ancient pagan rituals, most famously at Knossos in ancient Crete, where one was located in the basement of a palace where the mythic man-eating Minotaur was said to roam. According to ancient lore, the hero Theseus journeyed through the labyrinth to slay the evil Minotaur. Theseus' doubled-headed ax was called a 'labrys,' from which the word labyrinth was derived. Ceremonies re-enacting this myth as a ritual labyrinth walk are still performed today. Other labyrinths have been tied to fertility rites and goddess worship (M. Tooley, September 2000). 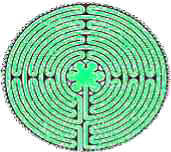 Modern disciples of the labyrinth propose that ancient Christians used the labyrinth as a means of spiritual meditation. Scholars insist there is absolutely no evidence of labyrinth walking by Christians (M. Tooley, September 2000, Maze Craze. www.touchstonemag.com ). So if these were practiced by other religions and cultures that are of a non Christian origin, what kind of value would they have to offer a Christian who is supposed to have all that he needs in Jesus Christ according to the Scripture? We find the use of this design is put to smaller patterns that are a non-walk though spiritual practice. The patterns of the labyrinth are similar in design and conception to the mandalas of South Asian Buddhism, that are supposed to be physical representations of the spiritual realm designed to aid in meditation. Mandala means - circle: it is a circular design, which is used to focus in on and bring one into a meditative state. We are told that true meditation occurs when the physical brain has been calmed or neutralized, a mantra or a mandala is used to bring calmness so the mind is then freed and can then discover new truths it normally was not open to find. Labyrinths have become so popular that there is a Labyrinth Society, based in Connecticut which is a national network of labyrinth users. We are told there are an estimated 1,000 labyrinths created across America, Grace Cathedral Labyrinth Project, the St. Louis Labyrinth Project, St. Charles Episcopal Church Labyrinth, the Labyrinth Project of Alabama. The foremost promoters of it are Jean Housten http://www.JeanHouston.org/ and http://www.gracecom.org/veriditas/index.shtml Grace Episcopal Cathedral. Dr. Jean Houston is the past president of the Association for Humanistic Psychology and is one of the premiere New Age promoters and speakers in North America. Jean Houston called The Starseed Transmissions, channeled by “Raphael” through Ken Carey” “perhaps the finest example of `channeled knowledge' I ever encountered.” She states “The very best way and perhaps for the present the only way [of contact with these entitles] is within the context of an altered state of consciousness” (Robert Masters and Jean Houston). One cannot underestimate the connection between her influence on Artress and her bringing the Labyrinth to Grace Cathedral who is open to New Age concepts. One of the major initiators in reviving the labyrinth in our time is Rev. Lauren Artress. After meeting Jean Houston Rev. Artress brought the form back to the Grace Cathedral of San Francisco, CA in 1992. Over one million people have walked this labyrinth to date. People from all different backgrounds and religions are using it. Jews, Buddhists and even Christians use the institute's labyrinth. If one visists Grace Cathedrals web site you find it being inclusive, they offer every conceivable item, from New Age holistic to interfaith to the Koran. They are church that is not holding the Christian distinctive at all. They are found in many sizes and shapes, and made from just about any natural material. They are built in a permanent fashion from stones, cut into turf, formed by mounds of earth, or imbedded designs in the floor of buildings. We are told that the labyrinth is a tool useful to people of all religions or no religion. Each person's walk can be interpreted differently each time to the same individual. From some of the quotes I have read one can assume life is one big labyrinth. This experiential walk is spiritualized to have meaning. “We are not human beings on a spiritual path, but spiritual beings on a human path” (Labyrinth, Walking a Sacred Path Reverend Lauren Artress). Labyrinths are being used for reflection, meditation, prayer with various interpretations of what these mean. Some see it as a metaphor of the path of life, a journeying to God. Some ask forgiveness on the way in and empowerment on the way out. The participant can ascribe their own spiritual meaning to this ritual walk, the theory is that by walking the labyrinth one partakes of a spiritual journey of self -examination and enlightenment. What happens to everyone may not all be the same, but many claim to receive a spiritual transformation. R. White writes,“Walking the labyrinth supposedly promotes spiritual awakening and deeper inner knowledge. Followers testify to arousal of feelings (good and bad), renewed creativity, brain re-mapping and energy production. Labyrinths have taken their place next to sacred circle dances and sweet-grass ceremonies taught as rediscovered ancient practices to enhance spiritual growth”(White, R. Aug. 15, 2000. Walking the Labyrinth: New Age Fad or Traditional Technique? http://www.christianweek.org). What are Labyrinths used for; the explanations come from those using it. The Rev. Sarah Bentley of New Life Institute, a center for counseling, education and spiritual growth related to the Austin-area United Methodist churches, said she introduces labyrinths to people as a form of meditation. They are training the participant in a walking meditation. Many have various ways to explain the Labyrinth. Artress may not be pouring her own interpretation into this as we find the Labyrinth was used in ancient pagan cultures. In Dr. Lauren Artress’ book about the labyrinth, “Walking a Sacred Path,” she states, “The web of creation has been thrown out of balance.” So they see it as a pathway to gain connection with the Earth Mother, uniting with all her creatures and absorbing the energies that help bring balance. Despite these New Age concepts being used, it may not be so far from the truth of how it was orginally used. “The labyrinth awaits our discovery, for it will guide us through the troubles of our lives to the grand, mysterious patterns that shape the web of Creation. It will lead us toward the Source and eventually guide us home” (Lauren Artress Author of Walking a Sacred Path). It becomes apparent that although this is taking place inside some churches, it really is a non-Christian practice. Many new Agers claim they are not into religion, but practice spirituality. With these type of descriptions, one may wonder what does this have to do with Christianity? The answer is Nothing. In Biblical terms original innocence would mean prior to Adam and Eve's sin. With all these wonderful statements one would think they found some secret way to solve almost all of mankinds problems. If we are to believe all these claims of healing and transformation maybe we could get terrorists to walk through it, this may bring them an attitude adjustment. If everyone could walk a Labyrinth New Agers would no longer have to visualize world peace. Unfortunately we cannot just walk for peace to take place. Unfortunately she seems to equate new age with something modern and not ancient, as we have already seen, the labyrinth is ancient and used by other religions besides being adopted into some churches in the middle ages. Most trace the modern resurgence of labyrinths to Lauren Artess. If she is the authority on it, and brought it to the church, then we should listen carefully to what she is saying to see if it is a true spiritual practice. Lauren was aware of labyrinths as a child. In her visit to Chartres in1991 she talked to Jean Huston and worked with her and went through a labyrinth. Then she went home and said, “Wow, something important happened there.” I remember walking around the room yelling, “What is it?” And then the idea came through - put the labyrinth in the cathedral.” (Zions Herald interview with Lauren Artress). In 1996 Artress created Veriditas, a non-profit dedicated to introducing people to the healing, meditative powers of the labyrinth. The Bible has nothing to say about a feminine aspect to the divine mother, a Goddess, so this shows this cannot be related to Christianity but paganism. She describes her discovery of the labyrinth as one of the “most astonishing events of my life.” For her, the labyrinth is a “spiritual tool meant to awaken us to the deep rhythm that unites us to ourselves and to the Light that calls from within.” Veriditas promotes walking through the labyrinth as a way of discovery, to find healing, self-knowledge and continuing to weave the Universal Web of Creation.” An important fact to know is that geomancy and other occult arts are often incorporated in the building of labyrinths. Charles Gilchrist a labyrinth promoter states it has a direct connection to “Sacred Geometry,” a powerful potential as an oracle. And there are other “oracle systems” that are related to Sacred Geometry, Astrology, Numerology, I Ching, Rune Stones, and the Tarot. “Veriditas is the non-profit organization that has grown up around the labyrinths at Grace Cathedral. They are dedicated to teaching people the history, use and potential of this spiritual tool. Veriditas Project founder Lauren Artress promotes the labyrinth as a way to connect with the divine feminine, the god within.” (Penn, September 1999 The New Age movement in the Episcopal Church). Clearly this is a New Age observance with practices for global tarnsformation which has a long history of being the goal for the New Age movement. http://www.religionnews.com/press02/0321_1.html March 11, 2002 The World-Wide Labyrinth Project featured three people. Chartres, France - In 1999 The Reverend Canon Lauren Artress established “Let Us Walk With Mary,” a unique and enlightening program for pilgrims seeking spiritual growth. Certainly one is able to do this without a Labyrinth, the early church did not depend on this vehicle to help them with their spirituality. Jesus already instructed us how to be open to his leading and his answers so why do we need to use this other religious device? Religious syncretism is probably the most dangerous we can involve ourselves in because we can put a label on something and call it something it essentially is not. These are two different religious, spiritual systems. Starhawk, a practicing witch and head of a coven, celebrated New Year 2000 by walking the Labyrinth on her San Francisco area Ranch. Psychotherapist Dr Lauren Artress says, “To walk a sacred path is to discover our inner sacred space: that core of feeling that is waiting to have life breathed back into it through symbols, archetypal forms like the labyrinth, rituals, stories, and myths.” This has nothing to do with practicing Christianity and everything to do with other spirtual practices that Bible tells us not to participate in. In the article Mystical paths for contemplation 5/18/2002 Artress recently talked about the popularity of this practice as she prepared to conduct workshops and tours of labyrinths in Europe. FaithLinks: What kind of Christian is typically attracted to labyrinth spirituality? I have got a better idea, read God’s letters to you, all 66 of them found in the Bible for your spiritual renewal. Can one seek or come to know God by a Labyrinth walk? It may be the latest fashion in spirituality touted as a spiritual tool of meditation and prayer but is it for a Christian? We are told in Colossians 2: 8: “See to it that no one takes you captive through philosophy and empty deceit, according to human tradition, according to the basic principles of the world, and not according to Christ.” Some are trying to justify this as a Christian tradition. In fact it couldn’t be, not just because it is not found in the Bible, but because it goes against everything the Bible and Christianity teaches for one to practice true spirituality. Walking through the Labyrinth is not a rediscovery of a lost form of Christian spirituality but pagan spirituality. Though it may be reformed and repackaged to our modern times, we can be assured it has nothing to do with Jesus who gave man the true spiritual way of life. I don’t think one can Christianize this practice, nor justify its use. Especially with what we have already discovered how it is being used. Is it pleasing to God that we walk labyrinths when He has told us not to take up pagan practices? Divine feminine, earth energies have nothing to do with Jesus Christ and the truth He has delivered. There are already a number of Christians who are practicing the various types of contemplative prayer promoted by Richard Foster, Thomas Merton, Thomas Keating, and others. A good portion is being promoted through the Catholic contemplative prayer movement. Many of these same people are open to or already doing labyrinth walks as a meditative practice. Walking mediation and stopping to quiet oneself is not promoting prayer. Not all that is claimed to be spiritual, is good or from God. We are told as Christians to test the Spirits. Do we now need experiential prayer elements? Did Jesus look for a Labyrinth to teach people to pray? What happened to going into our rooms to pray quietly (Matthew 6:6)? Inclusiveness is the goal of the New age movement, and they have their light bearers influencing churches that are not discerning by the Word of God. With an open-minded approach, certain Christian church’s can certainly embrace foreign religious practices to their own ruin. Artress does not withhold her rejection of the straight and narrow way found within Christianity. She explains the labyrinth is more forgiving and leads its followers forward in a flawless path. God’s word states you cannot walk the wide road and claim to follow Christ who says HIS way is the narrow road and has nothing to do with a Labyrinth. In Matthew 7:13 Jesus tells us the only way to practice a spiritual life is to enter into life through the narrow gate because the wide and easy road leads to destruction. This does not mean entering a labyrinth to walk its path. In 2 Timothy 3: 16 we are told: “All Scripture is inspired by God and is useful for teaching, for reproof, for correction and for training in righteousness, that the man of God may be complete, thoroughly equipped for every good work.” It is God’s Word that we are trained to know and follow for a true spiritual transformation. It is objective, we are not to seek subjective experiences using other religious methods. The New age teaches experience for self- transformation and discovering the god within is not from the same source. The very reason people end up using labyrinths and other such methods to find their spirituality is because they are not holding and promoting the word of God which is all one needs to be complete, thoroughly equipped for every good work. Though it is currently fashionable for “Christians” to participate in walking Labyrinths along with other religions, it is a clear sign the Word of God is not being upheld but is being replaced with subjective feelings, through New Age spirituality. Despite testimonials from those who do not know the word of God, it is essentially using a pagan religious practice. This cannot have any spiritual benefit for a Christian, but one can possibly have a relaxing time as they enjoy the walk, but then, getting away into the outdoors into a new environment with the least amount of concentration will relieve you of your stress as well. There is no basis for those who practice Biblical Christianity to embrace the labyrinth as an acceptable tool for meditation and prayer? It is inherently New Age, let them have it.